Part of the bumper, fender and protective undercarriage of a brand new car was torn apart in the driveway of a Gibsonton woman's home Monday night. It's believed it could be the result of a coyote. Part of the bumper, fender and protective undercarriage of a brand new car was torn apart in the driveway of a Gibsonton woman's home Monday night. Debbie Ducko says her daughter was leaving the house at 10 p.m. to go to work when she noticed something was wrong with Debbie's car. 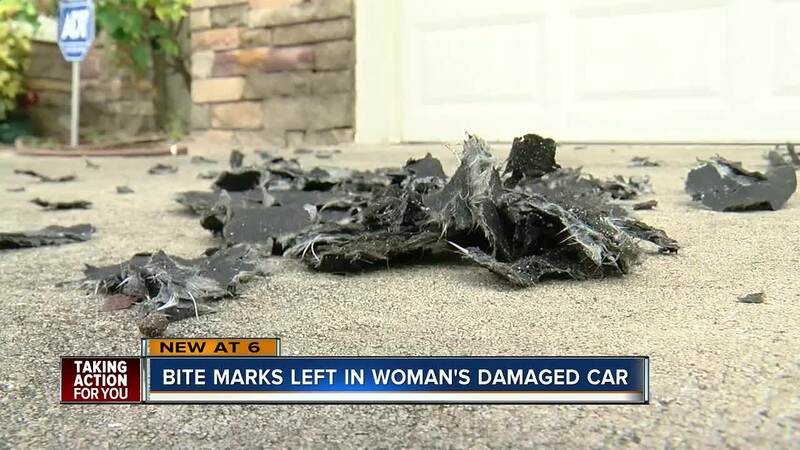 Debbie came outside to find several pieces of her car in the driveway and scratches on the paint. "Who the hell did this to my car?" Ducko questioned initially before seeing small bite marks in the plastic. "Part of the bumper, the rubber bumper, you can see the teeth marks," she said, holding up the mangled piece of plastic. When she called law enforcement, they told her to call Florida Fish and Wildlife to see if they could help identify the type of animal that did this. At first, FWC thought it was a rabid animal, but on a second look at the pictures, they believe it could have been a coyote or wild dog trying to chase down a small animal that crawled under her car. "If they can do that to a car, what can I do to me or my little 5-pound Yorkie?" she asked. She's worried about a recent rabies alert near her neighborhood and hopes it wasn't a rabid animal. The rabies alert was for parts of Gibsonton after a man was attacked by a rabid cat. That alert goes for at least 60 days and was issued August 28th. "Putting two and two together it’s like that’s not even two blocks away from me so I’m gonna be careful with my babies," she said. She worries if this animal was capable of doing this to her car, what could happen to a small dog or child. FWC says if it was a coyote, investing in motion activated lights or sprinklers can help, or even yelling and throwing rocks at a coyote can help scare them away. Ducko has an appointment with the repair shop Thursday to find out how bad the damage is.